A lot of brands and agencies are locked in to what content they publish on social media by what's on their social media content or editorial calendar. 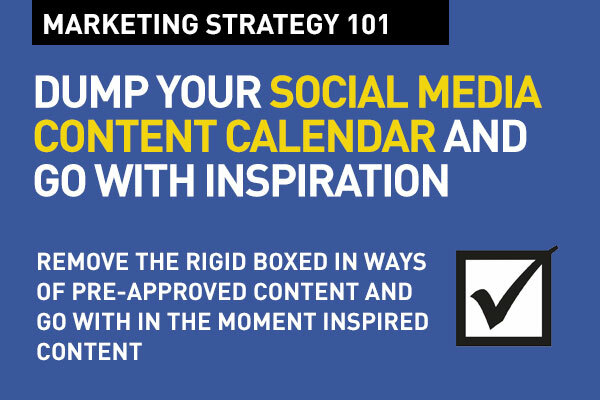 Perhaps it is a good idea to dump your social media content calendar. This is a safety net that can well be put aside and used simply for planning content for major events and occasions. It's much better to rely on everyday content that's inspired and in-the-moment. Earlier, I wrote a post on 6 ways to get content marketing right. Yes, I did say you need to plan ahead, you need to have done your homework, your research, but I did not say that you really need to have cool content planned for National Dairy Farmers Day. Unless of course, you are the dairy that supplies Ben and Jerry's. I am not really saying that you should dump your content calendar completely. It is useful as a tool to plan ahead for what you are going to publish that would meet your overall brand goals, gathering inputs from departments, project managing and having a disciplined approach. But when it boxes you in and stamps out room for inspiration, leaves little room for the here and now, being opportunistic and igniting sparks of creativity, it does more harm than good. 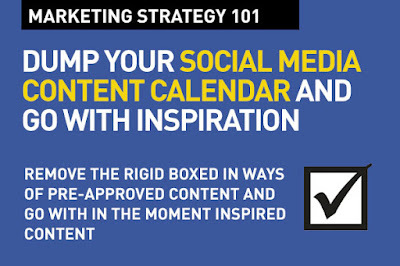 Dump that social media content calendar, perhaps. 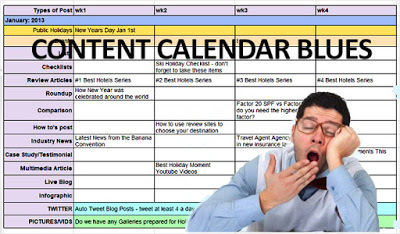 A brand's true content goal is engagement, but if the content is derived from filling in boxes on a spreadsheet, there's little value in that. Where's the right time, right audience factor in a spreadsheet filled in months in advance? YOU SHOULD: Transform your digital marketing by Being 'Right There, Right Then'. And a pre-set content plan that's rigid and safe, and pre-approved does not allow you to be there in the moment. REMEMBER THAT: Intent is the new black in digital marketing. In-the-moment marketing is what's hot. Let consumers, customers, the competition inspire you every day. Track what they're doing now, research live what they're talking about, and deliver content that grows and glows around that. Be in the moment, not on an Excel sheet. Don't let blank boxes kill inspiration. So? Dump that social media content calendar, perhaps. Go with inspired content. Please share this post with your friends and colleagues today... And do comment if you feel you want to add to this. This is a good point because most companies using social media do content that is pre planned and serving the purpose of only the company and brand rather than the target audience. Easily reach your prospects leads with business email lists and full-service Digital Marketing Services. You want engagement, virality, retweets, likes, shares, followers, and all the other good things that come to social media marketers. If your social media management doesn’t promote this kind of activity, then it’s not even worth it to keep trying! Checkout social media content writing services !